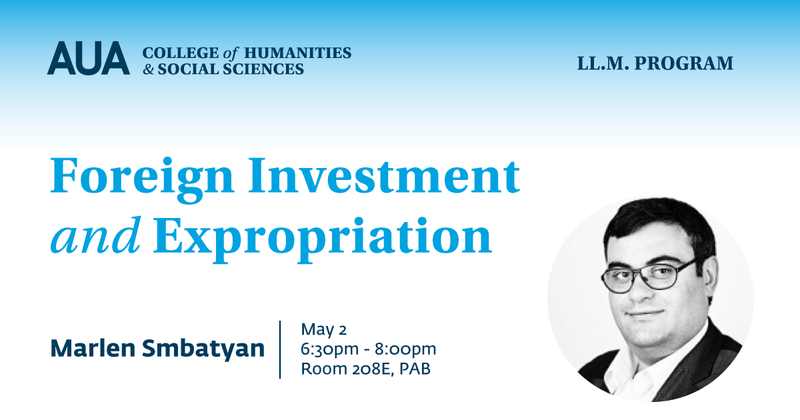 The lecture examines an important topic of international investment law and state-investor disputes: expropriation, including types of expropriation, direct and indirect expropriation, lawful expropriation, BIT definitions and the most recent approaches of various ICSD and NAFTA tribunals toward the issue. Marlen Smbatyan is an experienced attorney-at-law and legal executive who is skilled in international investment law, offshore jurisdictions, English Law, cryptocurrencies and ICOs, corporate law and litigation, international financial law, international commercial law and dispute resolution, IT law, and employment law. He has represented and provided legal services to such clients as Google., McDonald’s., Philip Morris International, Nivea, Dilijan International School of Armenia FNDN and others. He has also advised on cross-border transactions, joint venture-related issues, incorporation of offshore and onshore companies, and managed a team of lawyers in employment law-related class action.